The mission of Quincy Preserves, Inc., is to foster awareness of and to promote appreciation of the historic architecture of Quincy, Illinois, and Adams County and to encourage active membership involvement in the recognizing, protecting, maintaining, and displaying of these structures. Starting as an outgrowth of the Quincy Society of Fine Arts in the mid 1970’s, Quincy Preserves has encouraged owners of historically and architecturally significant structures to restore and maintain them to their original condition. Since that time many homes and buildings have been preserved. This movement continues throughout the entire city. Quincy Preserves has provided financial assistance toward preservation and/or restoration work at the Washington Theater, Woodland Cemetery, the Dr. Richard Eell House, Villa Kathrine, and the Gardner Museum. Donations are made to the Quincy Public Library to expand its collection of preservation books, magazines, and videos. Four $500.00 scholarships have been awarded to area students whose applications have included essays on preservation topics. Quincy Preserves Façade Committee has made grants and loans to several businesses in the Historic Quincy Business District including the Busy Bistro, Celia’s, and Quincy Steamboat Company. These funds are used to restore facades to their original appearance. 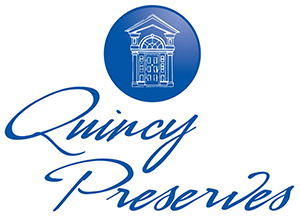 At its annual meeting, Quincy Preserves recognizes the preservation efforts of homeowners with commemorative plaques. To support the many projects of Quincy Preserves, two annual architectural tours are conducted.